65 years after the Second World War, thousands of soldiers who fought on all sides are still considered “missing in action”. Finding their remains, identifying the lost soldiers and connecting with their families is the job of free will relic hunters. Their calling is excavation of historical battle sites and mass graves of the war. 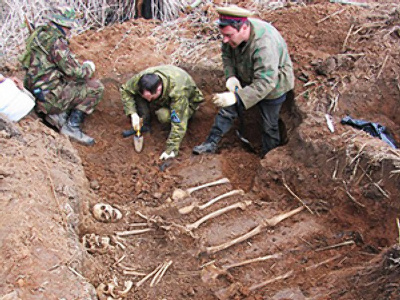 Dedicated groups of people spend summers digging in search of relics that can help in identifying the men that perished in the fronts of the Great Patriotic War. Their discoveries often transfer the lost soldiers from the status MIA to KIA (killed in action) – and finally deliver the truth of what happened to the surviving relatives. There are quite a number of people who declare themselves relic hunters, but only some 10 per cent of them really help recreate the events of the past and provide information, knowledge and preservation of coins, artifacts and relics. Among the remaining great majority there are men without morals, usually called black or grave relic hunters, who dig up graves in the hope of finding medals, guns, coins or even gold teeth and selling them to fence dealers later. These people work in gloves, being afraid of possible deadly infections, and when they don’t find what they were hoping for, they simply leave the soldiers’ remains there, on the ground, not bothering to bury them. For them, digging up graves is usually their only source of income, so they stop at nothing to make a little money. Others purposefully look for shells, mines and guns, though they are not squeamish about tin hats if they happen to find any – all the finds are then sold, mainly illegally. This second type bears the name of red relic hunters and consists mainly of former military men, snipers and mine pickers. They treat the graves with due respect, and if they happen to find the remains of a soldier, they do everything in their hands to establish his identity. Still others are villagers who live near historical battle sites and thus deem it their duty to at least try finding something useful and valuable. Such benevolent intentions often end up sadly: the locals rarely know how to handle mines and shells, and so bring them home for a closer inspection. Every so often, the missiles that have been buried for half a century, deep in the ground, explode causing death to innocent over-curious people. The motto of white relic hunters, whose work is perfectly legal and essential, is as follows: “The war won’t be over until the last soldier is buried with due solemnities”. Their primary objective is to find the remains of soldiers and try to identify them with the help of the tags that every military man had to wear. This is not an easy task, but if successfully achieved, it stands high. When and if the soldier is finally identified, relic hunters spend hours at the State Archive of the Russian Federation looking for the soldier’s relatives, who will now have the opportunity to bury him. The expeditions are usually carried out in summer, when the ground is soft and dry. Spring is the time when relic hunters go on the scout – they walk from door to door talking to seniors and looking for mass graves. Sometimes they are lucky and locals indicate the sites, and if not – they have to start all over again in the neighboring region. Relic hunters set up research organizations and publish the names of the identified soldiers and officers on their sites, so anyone willing can scan the list and probably find the name of his or her relative. There are a great number of such organizations and military patriotic clubs located in various regions of Russia where military operations were held at the beginning of 1940s. Grigory Kasminin, head of a military patriotic club “Sapsan” pointed out that relic hunters are not usually professional archeologists and historians: “Many young men willing to take part in digging expeditions come to our club to investigate what we are doing and stay. After they have gathered enough experience, they learn how to dig out military shells and guns carefully and then hand the finds to museums and law-enforcement agencies. And though the work is not always paid for, members of our club take it very seriously”. Relic hunting: hobby or bull work? The main difficulty relic hunters run against is the lack of legal defense: the status of the seekers is still not yet fixed by law. And though nowadays such organizations are gaining more and more state support, it is still, unfortunately, not enough. Apart from judicial hardships, relic hunters have to face moral discomfort as well, especially when dealing with the identified soldier’s relatives. Very often, elderly people come to military patriotic clubs asking for help – they wish to find their parents or other relatives who were killed during the war. Sometimes such conversations – or rather monologues – last for hours and relic hunters have to listen carefully, understand, console and try to help. Sometimes they are lucky – old photographs, medals and even letters may be of great help, but usually they have just recollections at their command. When asked about their choice of work, the majority of both experienced and young relic hunters have no answer. For some, such choice was an unexpected surprise – they just happened to find a skull while gathering mushrooms or berries in the woods in summer and could never forget the terrible find, thus becoming part of expeditions who dedicate all their time to relic hunting. Recovery teams do not consider themselves undertakers. Quite the contrary: the work helps them become more tolerant and kind. The soldiers they find are of various nationalities and religions, but when relatives of the dead serviceman arrive to weep for the deceased, the relic hunter often cries with them – so strong are the emotions. Relic hunters in this country do not need much, but the things they need they need badly. They cannot get used to the fact that millions of those who shed their blood for their country are still missing, lying in the ground – lost and forgotten. And they desperately want state support. Another thing they want is to have the researchers’ legal base created and the relic hunter’s status defined, so that their work can not only be valuable and essential, but also authorized and honorable.